Scotland’s health secretary has been told she must make time to visit Moray and guide efforts to repair the region’s health service. 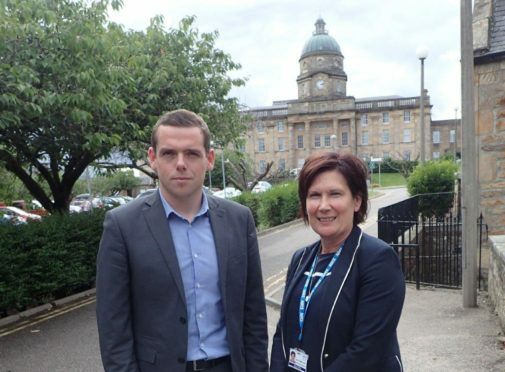 Moray MP Douglas Ross said that only by “direct intervention” and negotiation at a local level could Jeanne Freeman drive the required improvements. He criticised the health secretary for her apparent refusal to meet him to discuss the ongoing challenges. Ms Freeman instead invited Mr Ross to liaise with the acting chief executive of NHS Grampian, Amanda Croft. The Moray MP described the snub as “extremely disappointing” and said she had missed an opportunity to show the government cared for the quality of services in Moray. The Scottish Government said it was “untrue and unfair” to suggest it did not care about the challenges being faced and highlighted increased investment in the region. But Mr Ross said: “As MP, my role is first and foremost as a representative and I’m bitterly disappointed that the Scottish health minister has refused to meet with me to discuss serious concerns highlighted by the constituents I serve in Moray. “I know SNP members at Holyrood have met with UK government ministers and I would have hoped that similar, cross-party, constructive meetings could have been possible with SNP Ministers and MPs. NHS Grampian is currently working to return services to Dr Gray’s hospital, while it has also faced criticism over waiting lists. A Scottish Government spokesman said: “It’s both untrue and unfair to suggest we do not care about the particular challenges faced by the NHS in Scotland including in Grampian. “We understand the increasing demand and expectations placed on frontline services.